Hello, my name is Ceylon. So, I took some time yesterday and finished Ceylon. It was so much fun sewing this! I love how everything just came together with this one, the instructions were easy to follow, and even though there are quite a bit of parts and pieces and details with this, I never felt lost thanks to the great instructions. Yey Colette! Initially, I planned on making black fabric buttons, but when I came over these babies in my mothers stash, I new they were the perfect match for Ceylon. Not too small, not too big, and with just the right look! If (or more likely when) I´m making this again, I will add some centimeters to the length and maybe adjust the bust size up a bit. Other than that, the pattern came along nicely. I must give a shout out to Zoe´s article on piping on the Colette blog. It was the inspiration for the piping on this dress. Thanks! I made the piping myself out of some black bias tape and cord. I just placed the cord in the middle of the bias tape, pinned it there and stitched it up using a zipper foot on my sewing machine. I got this advise from the sales woman at my local fabric store, as they didn’t have (!) black piping. Ah! Totally lovely. (Like all your projects!) The Ceylon is actually one of my favorite patterns in the Colette line (so elegant!) but I’ve always hesitated on whether it would look good on me, but you’re starting to tempt me to get it … ; I just love the shape, it’s so flattering, and in the colors your chose, so feminine and summery. I’d totally invite you to tea if you weren’t on the other side of the planet. Keep ’em coming! This is sooooooo good! You are welcome for the inspiration! I was thinking about how to add piping to this pattern when I try it in the future. The buttons are beautiful and totally perfect for this dress. Looking forward to your take two! Gorgeous version! 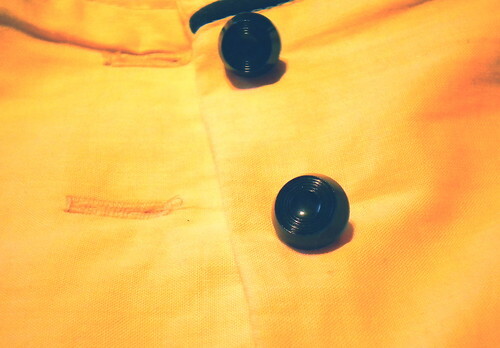 Love the black buttons, a perfect contrast to the soft summery peach. I almost bought Ceylon but changed my mind – all those buttonholes!! Looks fantastic on you though, excellent work! Wow, this is just beautiful! I’m sewing a Ceylon myself at the moment, and I love what you have done with the piping! It fits you excellently. Thank you all so much! I´m so glad you liked it. @Zoe: I wondered about the piping as well, and settled for this solution, but I think it will be mighty cool to add piping to the yoke as well. @Kjersti: Looking forward to seeing your version as well! Thanks Karin, that´s so nice of you! See you around! Love your blog! You have some really great posts here! in a blog post – I’m doing a roundup of some of my favourites from the Summer Essentials Flickr Group anmd I’d really like to include your Ceylon! oh, i love this dress. it’s wonderfully made! what fabric did you use? oh my lordy!!! This is the nicest dress i have ever seen! The piping looks fabulous! I would pay a small fortune for a dress like this. I can only dream about becomming this good at stitching! This is such a great Ceylon version! Very inspiring with the contrast piping and buttons! One of my favourites so far.